I was sleeping. The growling of thunder was getting louder and more steady, intruding itself ever more insistently into my consciousness, slowly prying me awake. I burrowed deeper under the fluffy blanket, pulling several layers of it up over my ears. But then the rain began, just a few drops at first, so I let my ears out from under the blanket, hoping to be lulled back to sleep. The rain pounded down harder, slapping and pinging on the roof. The thunder crashed and shook the house. I gave up and got out of bed. It wasn’t raining; it was hailing. 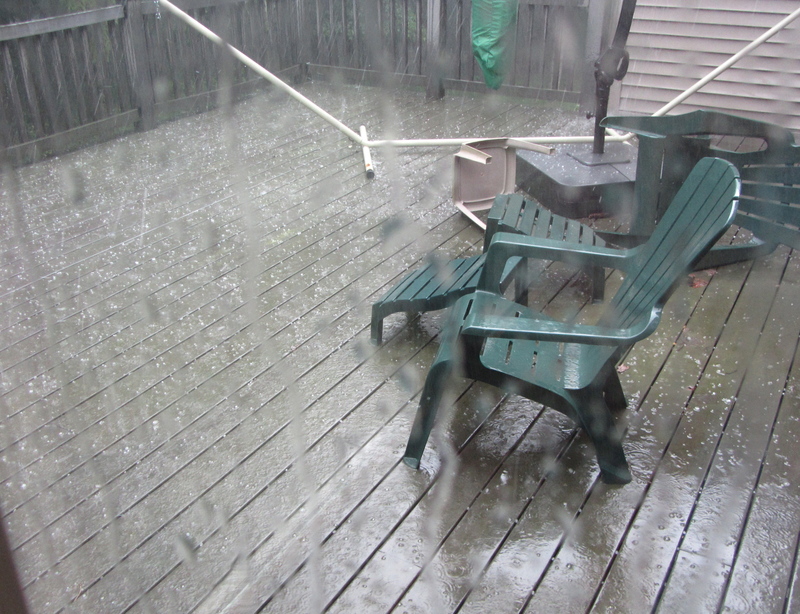 Quarter-sized hail, some of it, in the middle of July. No wonder I couldn’t get back to sleep! And 5 minutes later, it was sunny again.